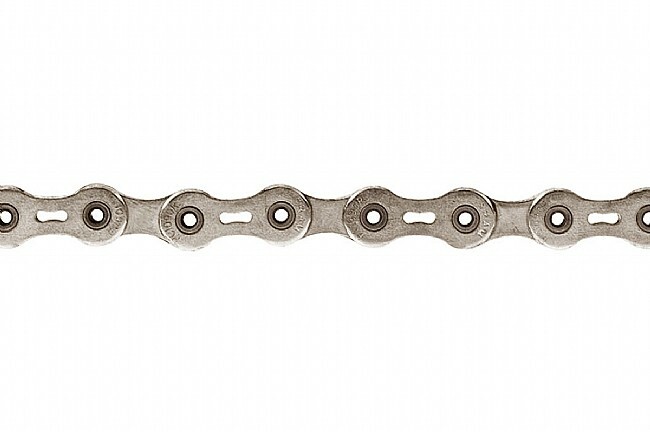 SRAM's PC-1091R 10-speed chain has all the features you expect in a top-performing, high-quality chain. Chrome-harded hollow pins and punched outer plates save weight, while nickel-plating on both inner and outer plates resists corrosion and contributes to the chain's excellent durability. The "1" at the end of the model number indicates a reshaped outer plate design for a smooth and quiet ride. The PC-1091R includes the PowerLock link for easy installation and removal; SRAM recommends that a new PowerLock link be used each time the chain is broken and re-connected. Recommended for SRAM Force/Rival 10-speed groups but is compatible with all Shimano and SRAM 10-speed systems. 5.9mm width, 114 links, just 251 grams. Great chain. Smooth and quiet. Plan to continue using this chain. I was using a Dura Ace chain that snapped at only about 400 miles, after putting this one on it was very quiet and seems to shift much better as well. Good shifts, reasonable weight and good durability, together with the reusable master link that makes chain removal and installation a piece of cake. This newer version is indeed quieter running than the previous PC1090. I am definitely a Shimano fan for just about everything else, but really prefer the SRAM chains. I still have never broken one and I really like the drilled side plates for weight reduction. We have some very steep hills and I sometimes shift down under a lot of pedal pressure. These chains hold up and don't complain, even with that kind of abuse. I run these chains with a KMC master link. Im sure the SRAM folks frown on this, but has worked fine for years. Otherwise, light, quite and excellent shifting. I originally used the DuraAce chain due to the noise of the earlier SRAM chains. When I could no longer get the DuraAce chain for my 10 speed I gave this a try. Nice change, very easy to install with no pins and runs quiet! Easy to assemble. Good value at the sale price. Was previously running a Dura Ace chain which was very quiet an shifted well. DA are just plain expensive. This chain meets the price point for value and a great chain as well. I've used them before and my only complaint is it's slightly louder on my Red drivetrain. Other than that it works perfectly. This is a nice chain in term for performance for flat rides, light weigh and quiet. But won't last if you do frequent climbing. After about 2-12 months 700 miles, mine was so stretched and needed replaced. My previous KMC lasted over 2000 miles. This chain shifts equally well with Shimano and as well as SRAM cassettes, and the master link is such a plus (no messing with Shimano installation pins). I've run thousands of miles with this chain and never missed a shift. It's dead quiet, too. Highly recommended if you want a light, versatile chain that consistently performs well. I use these chains to race, I wouldn't recommend it for just commuting or casual riding, they are too expensive and too fragile.